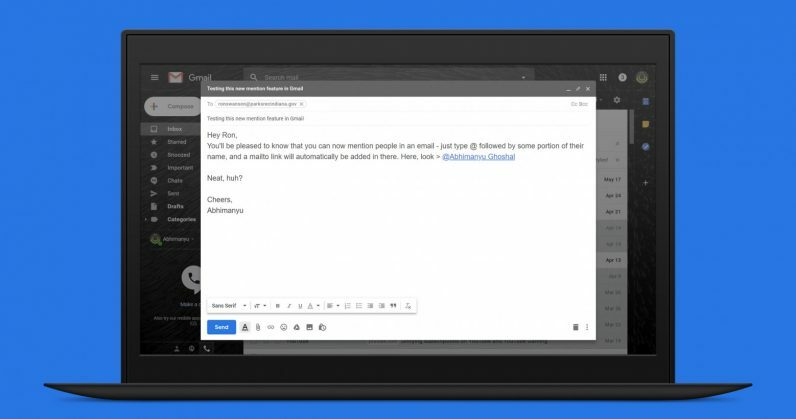 Gmail got a much-needed visual refresh and some clever new features recently, including Smart Compose and a snooze button for incoming messages. But did you know that the revamped interface also supports user mentions, à la Twitter? When you’re composing a new message or a reply, you can insert anyone’s email address in the body by entering the @ symbol, followed by their name. For example, @Abhimanyu will bring up a list of people in your contact list with that name, and choosing any of them will add a mailto link labeled with their name. When your recipient clicks that link, it’ll bring up a new compose window so they can write to that contact. That’s pretty useful for when you need to introduce someone to another contact, or list a bunch of people’s email addresses in a message quickly. If you mention someone with a + sign instead of the @ symbol, that contact will automatically be added as a recipient of your current message. It’s a nice touch that makes it a little easier to get your emails right – similar to how Gmail reminds you to attach a file when you mention that you’re doing so in your email, and don’t have anything attached. Both features are already live in the new Gmail interface – you can turn it on by choosing the option in the menu that pops up when you click the gear icon in the top right of your inbox.